« How Big is Your Christmas? As a child of the South, accustomed to the tones and the tales of my region, I was well aware of the”fires of hell”. Roadside signs proclaimed the eternal destiny of those who were not saved. I have discovered in later years, that many adult Christians remain committed to the most literal possible version of the fires of hell and will argue as though heaven itself depended on the burning flesh of the wretched souls in torment. This does not sound like the beginning of a Christmas-themed posting. It is the time of year that we sing of “Peace on Earth, good-will towards men,” and if at all possible we forget those men who, according to some, will never celebrate Christmas as they themselves become an eternal yule log to the comfort of so many. Strangely, the Orthodox Church, on the Sunday prior to Christmas, celebrates the Forefathers of Christ, remembering the righteous figures of the Old Testament whose work prefigured Christ’s coming into the world. 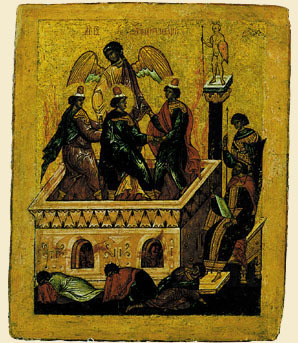 The chiefest of all those figures, whose icon adorns the central place of Orthodox veneration on that Sunday, is the icon of the Three Young Men, those who were tortured in the furnace of Babylon and refused to worship the false image of the wicked king. The Angel of the Lord went down into the furnace to join [them], and shook off the fiery flame of the furnace. He made the inside of the furnace to be as though a dew-laden breeze were blowing through it, so that the fire did not touch them at all, or cause them pain, or trouble them. Here stands the wonder of Christmas, given to us in the typological imagery of the Old Testament! A Nativity hymn in the Church declares: “The children of the Old Covenant who walked in the fire, yet were not burnt, prefigured the womb of the Maiden, which remained sealed when she gave birth in fashion past nature.” Like the fire that Moses saw present in the burning bush, the fire burns but does not consume. It is the Divine Energy of God, according to a number of fathers. “Our God is a consuming fire,” (Deuteronomy 4:24). He is also a fire that burns and yet does not consume. Christ Himself says, “I came to send fire on the earth, and how I wish it were already kindled!” (Luk 12:49 NKJ) Christmas is also the kindling of that fire. At His coming, all things approach their judgment. Wise men find their redemption, a wicked king finds his downfall. Angels find their voices and raise them in a manner that exceeds any praise ever offered. Israel becomes the God-trodden land and the Land of Promise becomes the Land of Fulfillment. This same fire is the fire which alights upon the heads of the Apostles at Pentecost and fills them with the Spirit. It is the transforming fire of God’s grace which burns up our dross and refines the works of righteousness. O Holy Night, the light is brightly shining! This entry was posted on December 18, 2011 at 5:09 pm and is filed under Orthodox Christianity. You can follow any responses to this entry through the RSS 2.0 feed. You can leave a response, or trackback from your own site. Thank you for these words to rekindle the flame of our hearts. May our hearts be on fire as our Lord enters into His creation. However aberrant and erroneous the views of those Christians in the South, there is a truth about the existence of hell nonetheless. I am reminded of our Savior’s words, “And do not fear those who can kill the body, but cannot kill the soul; rather fear him who can destroy both soul and body in hell.” Surely such warnings are not futile. Surely the existence of hell is not a hollow, idle tale not to be taken seriously. One can go to extremes both ways. Define Hell and name 3 people who might be there. Well put Father, well put indeed. Leonard, how about engaging with Jesus’ words? If Jesus spoke about it, there’s some reality to it, isn’t there? Or, do we become Gnostic when it comes to hell? And, since you are Catholic, I already know the CC’s current teaching on hell. If one, however, reads the writings of Christians throughout the ages, it could be said that the view of hell has gone through some transformations. Nonetheless, I go back to my original point. Jesus Christ spoke about hell, actually more specifically, warned about it. And He spoke about it as a reality, a place that was prepared for the devil and his angels, a place separated from Christ’s Heavenly Kingdom. Darlene I’m aware that Christ spoke of Hell and it’s well for me to bear in mind that it’s a place that I could go. Darlene, regarding the transformations in the understandings of “hell” that have historically taken place (and perhaps distorted some modern understandings), have you had the chance to listen to this podcast by Dr. Clark Carlton? I found it enlightening. As you may remember from reading some of my past comments here, it was this very issue that convinced me that in the Orthodox Church I had found the fullness of the Truth, presented at last in a way that did not distort my understanding of the mercy *and* truth of God revealed in Christ in the way that popular Evangelical understandings of “Penal Substitution” and Anselm’s “Satisfaction” theory of the Atonement, so central in Protestant and Reformed narratives of the nature of our salvation in Christ and the nature of Final Judgment, tended to do. I know Fr. Stephen’s attempts to correct a false understanding of the nature of hell (how I understand posts such as this one) can be challenging for some, but I’m curious as to whether, given that you seem to have been reading Fr. Stephen for some time, you really think he means to suggest that “. . . . the existence of hell is . . . a hollow, idle tale not to be taken seriously” (to use some of your own words)? I find I think much more soberly about the nature of my own particular Final Judgment as an Orthodox, given the Orthodox teaching of the reality and real nature of hell and the dynamic nature of our own personal appropriation of the salvation wrought for us in Christ, and yet much more hopefully (less deterministically) about the possibility of salvation for others in view of the purity of God’s Self-giving love revealed in Christ, than I ever did as a Protestant. As I think I once wrote to Leonard in fact, Fr Stephen has dealt with an Orthodox understanding of Hell very extensively on this site. You can search this blog and find ample treatments of Hell that take it very seriously and of course recognize hell as ‘real’. But to recognize hell as certainly real and worthy of warning, is very different than to accept all sorts of assumptions and false understandings of what it must be, and who must be going there, if it is real. St Silouan for example knew the only person in danger of hell was himself. For me to be orthodox in this matter, I do best to know the only person in danger of hell is myself. False understandings of hell absolutely abound in the modern Christian world. Well said. One can draw perfect parallel tracks between the Lord’s City without walls (Zech 2: 4-5) and Kalomiros’ Sacred fire that irrigates paradise yet suffocates and burns those who have hate in their hearts. If I may. Very true, Mark. However, even the understanding about what hell is and isn’t, how it is to be understood, etc. is not homogeneous in the Orthodox world. Not all Orthodox subscribe to the River of Fire perspective. True, Darlene. But in truth it makes more sense than anything else. Jesus sometimes spoke of Sheol or death, which we would has been destroyed, and sometimes of Gehenna. And sometimes it’s not clear (at least to me) about what he’s speaking — regardless of the words used. But I’m not sure the english word ‘hell’ is of much use anymore. It’s been so abused it’s meaning has almost been destroyed. I guess I’m saying that any discussion of ‘hell’ or what Jesus says presupposes that we have any idea what the hell ‘hell’ is. And I’m less than convinced we do. Perhaps I can be corrected, but I do not believe that ‘hell’ is either a Scriptural term or anything that Jesus spoke about. If you want to study the passage Darlene raised, it’s probably best to start with the greek before concluding that there is some kind of western medieval ‘hell’.